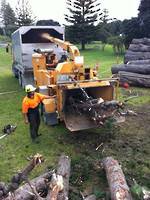 Orang-Otang Tree Trimmers is a well known, highly respected business that has been operating for over 15 years in and around North NZ. 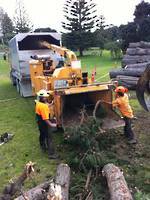 We have experienced, qualified arborists, logging crews and experienced machine operators who pride themselves on following strict professional working guidelines, efficient work practices and outstanding tree-care. Arboriculture covers all your important Plant and tree care including tree dismantles, removals, formative pruning, dead wooding, tree reduction and remedial works. Most of the time, when a tree needs to be safely removed it will be dismantled in sections. This involves the tree being climbed and taken down piece-by-piece in a safe manner. This can be a technical operation and involve rigging ropes to bring the tree down safely and ensure no structures are damaged. Whether a simple, straight forward tree removal, or, complex removal requiring the use of rigging, our arborists are highly-experienced professionals who are very well equipped to remove your trees properly, efficiently and safely, no matter where it is located. Not sure if the Tree needs to be removed? 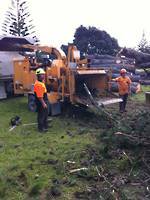 Tree removal is a last resort and there are certain circumstances when it is not necessary. Our arborists can help you decide whether or not a tree should be removed. Our substantial investment in wood chippers means that we can convert vast quantities of whole trees, branches and hedge prunnings into woodchips and mulch. Orang-Otang Tree Trimmers do not use landfill sites and estimate that we actually recycle 95% of all debris. We try to recycle as much of our off-cuts as possible, all leaves and smaller branches are chipped and reused as mulch. Larger branches and limbs are used as firewood. And any salvageable macrocarpa that is good enough is used for our Lasercut Designs products!